Vibrant artwork fills the school: every space is hung with frequently changing exhibitions of our pupils’ bold, energetic work. Every child is encouraged to discover his or her creative potential through specifically designed projects. The essence or our Art Department’s stimulating approach is reflected in its colourful creativity. The open, spacious art studio – itself a wonderful work in progress – has designated areas for drawing and painting, print making, sculpture, ceramics and fashion. An extensive, multicultural art library is used for the study of art history and to inspire new, original work. 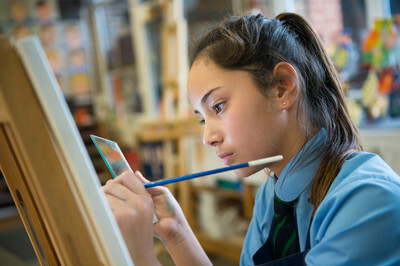 Through thematic approaches, pupils explore different media and develop ideas to an exceptional standard, several pupils each year win Art Scholarships to senior schools. With a foundation of traditional skills, children at the school create outstanding contemporary imagery with confidence. You can see examples of student art work created during last academic year below.